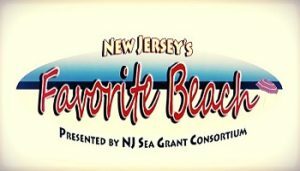 In honor of the July 4th holiday weekend, the New Jersey Sea Grant Consortium announced the official winners of this year’s ‘Favorite Beaches’ poll during a gorgeous beachside ceremony held at Music Pier in Ocean City on Thursday, June 29. This popular shore town remains defending overall champion, snagging more than half the votes (which totaled 7,200). The survey was first created in 2008 and initially deemed “New Jersey’s Top Ten Beaches,” to help encourage stewardship and pride in the state’s beaches while promoting a little healthy (and friendly) competition between NJ’s beloved beach towns. The contest has since become a highlight of the Garden State’s summer festivities. But over the years we’ve come to realize something at NJSGC — New Jerseyans are passionate about visiting ALL different sand and surf hotspots throughout the state! So, in order to better recognize every part of our wonderful coastline, as of 2016 we picked individual victors from all four coastal counties (while still naming a top overall winner). Voting really started to heat-up in June 2017. So without further delay, here is the official breakdown! Thank you again for your participation, and stay tuned for more details about next year! Please also visit NJSGC’s official Facebook and Instragram.